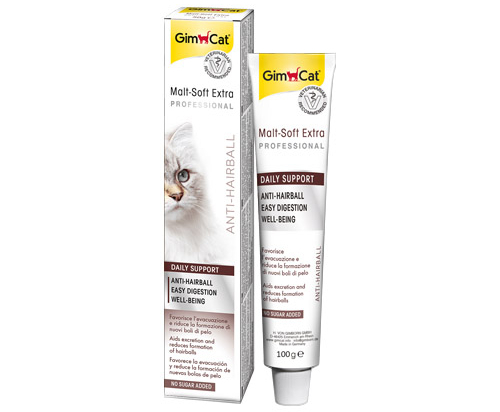 The GimCat Malt-Soft Extra Professional Paste contains an innovative formula that helps to prevent hairballs forming. The combination of malt, linseed oil, cellulose and beta-glucan helps the natural excretion of swallowed hair. This reduces the build-up of hairballs in the stomach and the need to vomit. Beta-glucan helps to avoid irritations in the gastrointestinal tract. Give 6 cm a day (1 cm = approx. 0.5 g), ideally by hand, straight from the tube. Can also be added to food. Quantity can also be doubled if required. Feed at room temperature.